My Sunday was planned out in my head: my husband working so my son and I were at home alone. 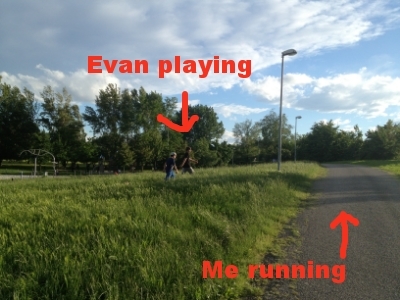 I would finish up some work in the morning, do a little housework, eat lunch with Evan and then in the afternoon I’d go on my long run while he did his homework. I’m supposed to run the Edinburgh half marathon this coming weekend but I haven’t really been training for it. Too much work and some health issues have kept me from committing to a set schedule. I know I can make it to the finish line, but I thought I’d throw in a nice 15km to get my head in the right place. I have to admit, my first thought at Evan’s question was, “My workout! “. I know, shoot me and give me the NOT best mother of the year award. I suggested he follow me on my workout on his bike, wouldn’t that be the same? No, he said, he wanted to go to the park on his bike. If you have children you know they usually have a plan in their head. In Evan’s case he kind of goes cuckoo if the plan in his head doesn’t somehow match reality. I’ve learned to ask him specifically what he’s wanting. Now who could ever turn down a request like that from a face like this? I decided to put my running clothes on anyway, bring him to the park, and then just throw in running whenever I could. The park is one kilometre from our house. I ran he followed on his bike. 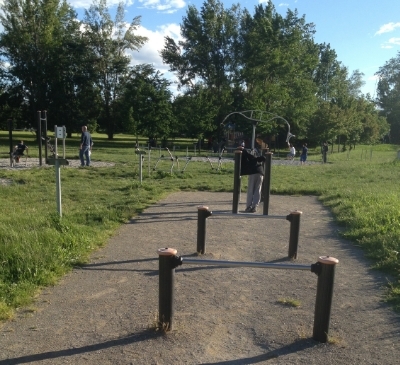 We biked/ran around the park perimeter, checking out what was going on and who was there. He spotted a group playing cricket and decided he wanted to watch for awhile. There wasn’t a lot of action going on as the players kept stopping the game for cellphone calls. We moved on to the fitness area. With my GPS still going, we ran over the obstacles to see who could do it faster. There’s also a really fun balancing swing with a bar on one and side and a seat on the other. Adults and children can play on it and this is where he found some friends. As they ran around the swing, I kept going back and forth on the obstacles to keep moving. At some point one of the kids remembered he had a ball so they started kicking it around, and Evan was happily lost in play. This was the perfect moment to start running again so I let him know that I’d be on the bike path right next to where he was playing. It was short, probably 400 metres, but I could keep an eye on him the whole time and he in turn could always see where I was. I just had to keep moving like a hamster! We stayed until the sun set and we started to get cold. 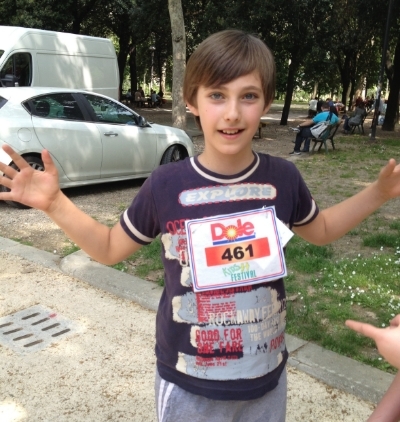 When we got back home I’d clocked 11 kilometres of movement and I had one happy boy. I may not have a fast time in Edinburgh this weekend, but while I’m running I can think about that wonderful afternoon. What a lovely way to get 11km in. I didn't realise there was cricket in Italy? No cricket in Italy, just nostalgic immigrants! Glad you had an awesome day! And, an awesome workout.... Miss chatting with you!